Want to do something truly epic? Take our deluxe Hoover Dam bus tour. The Dam is recognized as Nevada’s #1 tourist attraction and one of the U.S.’ Seven Modern Civil Engineering Wonders. Amid all the accolades, one thing is certain: If you want take a break from Vegas, put this trip at the top of your list. The Dam, which is just 25 miles east of Las Vegas, was built during the Great Depression between 1931-1936. Nearly 100 men lost their lives during its construction but the more 1 million people who annually visit the structure honor their service. This trip departs once a day in the morning at approximately 9:30 a.m. Transportation is by full sized modern motor coach, which leaves Las Vegas before cresting through Henderson and Boulder City (built specifically to house Dam workers) before skirting the edges of Lake Mead, the very body of water that The Dam impounds. You’ll exit the bus at the Dam’s main parking garage, located in the center of the action. 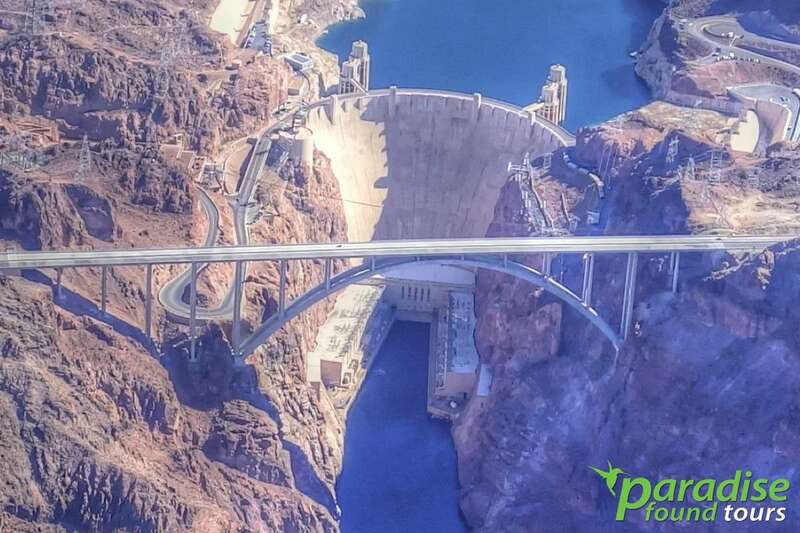 Here you’ll be able to walk to the Mike O’Callaghan – Pat Tillman Memorial Hoover Dam Bypass Bridge on the Arizona side for fantastic Hoover Dam photo opportunities. You also are ticketed to take the Power-Plant Tour, which is run by the U.S. Govt. and goes to the bottom where the Dam’s giant turbines (a/k/a the engine room) are housed. After you explore the generator room, check out the exhibit rooms, observation deck, Visitor’s Center and the museum for more adventure. Back on top, checkout out all the Art Deco architecture that dots the area (make sure to check out the “nymphs” and the astrological calendar) before ducking into the gift store and loading up on one-of-a-kind souvenirs (snacks and drinks are available for purchase in the gift shop). Then it’s back on the bus for a return to Las Vegas around 2:30 Pm – 3:30 Pm. Free pick up and drop off at your Las Vegas Strip hotel. Deluxe luxury modern motorcoach with superior climate control. Professional guide service ensures you see everything the Dam has to offer. Full 2 hours exploring the Dam. Lake Mead and Colorado River scenic photo stop. Total tour time (door to door) is approx 5 hours with your return back to your room between 2:30 PM – 3:30 p.m.
Hotel Pickup: Our tour includes free hotel pick up and drop off at most Las Vegas hotels. Please indicate the resort/hotel where you are staying on our online booking form. This tour does not operate on Thanksgiving Day or Christmas Day.